Spaceflight Pollution: How Do Rocket Launches and Space Junk Affect Earth's Atmosphere? 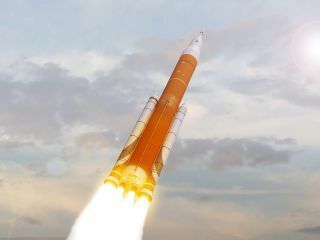 NASA's in-development Space Launch System (SLS) will make use of powerful solid rocket motors. Nobody knows the extent to which rocket launches and re-entering space debris affect Earth's atmosphere — but such ignorance could be remedied soon. The issue of rocket emissions — which deliver gases and particles directly into the middle and upper atmosphere — will be included in a forthcoming United Nations 2018 Quadrennial Global Ozone Assessment that delves into the substances responsible for ozone depletion. "The climate impact of rockets has not really been seriously addressed as yet," Ross, a senior project engineer for civil and commercial launch projects at The Aerospace Corporation in El Segundo, California, told Space.com. "But with respect to ozone, we now understand that the climate and ozone impacts of rocket exhaust are completely intertwined." Rocket soot accumulates in the upper stratosphere, where the particles absorb sunlight, Ross said. This accumulation heats the upper stratosphere, changing chemical reaction rates and likely leading to ozone loss, he added. In flagging the issue, Ross said he hopes the scientific community becomes interested enough to start running atmospheric models of the phenomenon — especially because the pace of rocket launches is expected to ramp up significantly in the coming decades. "I think we're at about that point," Ross said. A key study focus is the climate impact of major rocket-engine emissions: carbon dioxide, water, black carbon and alumina particles discharged by solid rocket-booster motors. A recent finding, Ross said, is that alumina particles, previously thought to cool the Earth by scattering solar flux back to space, actually warm the planet, by absorbing outgoing terrestrial, long-wave radiation. However, fully appreciating the microphysics of alumina and other rocket emissions introduced into the atmosphere requires more research, he added. For example, the interactions between Earth's atmosphere and exhaust from methane-fueled rocket engines have not been modeled, "so we really don't know" the effects these rockets have, Ross said. There's no yardstick by which to assess how significant the impacts of rocket exhaust may be, he added. "The notion of what is the metric by which rocket exhaust is to be judged … that is a completely open question," Ross said. "Then, compare that metric to the expected growth in launch rates. That really needs to be done. Just saying the ozone loss is too big — that's not an acceptable metric." There has been a lot of buzz recently about spaceflight companies shooting for frequent "airline-like operations," but scientists, engineers and policy makers generally are not "putting two and two together with respect to the emissions that are implied by that idea," Ross said. Researchers are investigating the extent to which rocket exhaust and falling space debris contribute to depleting Earth's ozone. Space hardware falling back to Earth can affect the atmosphere as well, so re-entering orbital debris should also be studied, Ross said. "Vaporize" may mean "disappear" in most people's minds, but that's assuredly not the case with re-entering space junk, Ross said. Such debris, he said, generates "re-entry smoke particles" (RSPs) of unknown composition and reactivity. Scientific models suggest that at least 50 percent of a given debris object will end up as RSPs during re-entry. "In that crucial 20 seconds of re-entry, you go from heating to melting to vaporization and then back into dust. How does that happen? What is that composition? We don't know at all. We need to get away from this idea that vaporization equals disappearance," Ross said. "Vaporization equals dust production. That process isn't well-understood at all. Again, we need to know the microphysics of these recondensed particles." An Orbital ATK Cygnus cargo ship plunges into Earth's atmosphere in a fiery finale. Vaporization of discarded space hardware equals dust production — a process that is not well-understood. The plunge into Earth's atmosphere of derelict satellites, rocket stages and other space flotsam is a common occurrence. For spacecraft re-entries, that process is "basically burning computers," Ross said. During re-entry, big chunks of aluminum and other materials are subjected to intense heating. The chemical kinetics of the particles that are produced in this way have not been examined, Ross said. Some particles are very reactive, so small amounts of them could have a significant effect on atmospheric chemistry, he added. "So far, nobody has deemed it important enough to study, and I believe it is," Ross said.